Raju gets lost in the mountains when he goes to find orchids for chutki on her birthday. 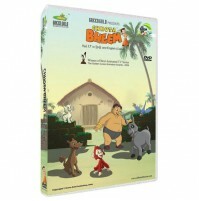 When Bheem and team go insearch of him, they face the monster yeti who has kidnapped little Raju. All the old enemies of Bheem come together to take revenge. But little do they know the strength of our mighty hero! Watch the kids go fishing and have fun with the dolphins. Raju wins the junior boxing championship, be a part of it! Celebrate with Indumati on her birthday. Have fun!